Is your wife sick of the permanent conflict and wants you to change? Help, My wife is threatening to leave me, she accuses me of passive aggressive behavior! Is this your main concern now? Are you a man in risk of losing your wife because she feels that your “passive aggressive behavior” destroys your marriage’s trust and makes communication impossible? Does she complain about you using passive aggressive ways to avoid dealing with normal relationship issues? Is she saying that you use the “cold shoulder” behavior on her often? You have here a hot, painful relational issue that needs to be addressed immediately.What is my solution to this passive aggression problem menacing your marriage survival? Understand the impact this behavior is causing on your marriage. Take ownership of your behavioral problem by understanding it. Learn new ways to frame and resolve conflicts in an effective way. Having a coaching session will put you in the right path! What are the 3 most powerful benefits that this conflict coaching can provide you with? Learn and apply new behaviors to your relationship, that will allow the relationship to grow, making you and your spouse happier. Improve your relationships in general, knowing that you can face any demand, and deal with it in a successful way for all involved. 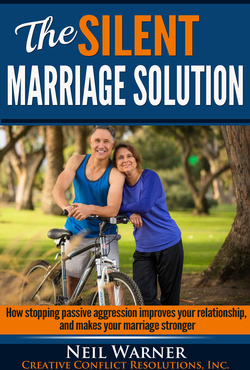 HAVE MORE STABILITY: Reconnecting as a grown up man with your spouse prevents the destruction of your family through divorce, and avoid all the financial and emotional costs that passive aggression leading to divorce involves. Hope this is enough for now….just send me a form filled with your information, and I will send you the first step of this process, the “What is your Passive Aggression Quotient?” survey to get to know the degree of passive aggression hidden in your usual behaviors. And you will know what to do next! And here are THE TWO LINKS TO BEGIN THE PROCESS: TAKE THE TEST, AND SCHEDULE A COACHING SESSION! Thanks for your attention, and see you after you get your results!